The Trainer Jockey Combo Stats report shows that David O'Meara and Daniel Tudhope have been in great form together recently. Over the past 30 days, they've managed to have five winners (33.33%) and seven places (46.67%) from 15 runners, for level stakes profits of 27.00 and 30.13 respectively and an Impact Value of 3.41. They have three together at Pontefract today, and I am going to be taking a closer look at Lamloon, who runs in a wide open one-mile handicap and is currently priced around 7/1. Lamloon got a good start in his win at Nottingham last month and stayed on strongly at the finish. He has to race with an extra four pounds here today but looks to have improvement in him and with the yard in decent form, I think he has a chance. As well as being in good current form, O'Meara has a good record here at Pontefract. Over the past year, he's had nine winners (19.57%) and 17 places (36.96%) from 46 runners, for an Impact Value of 1.74. Daniel Tudhope has been riding extremely well over the past few weeks and his figures back that up. From his rides over the last two weeks, he's had five winners (16.13%) and 12 places (38.71%) from 31 runners, for level stakes profits of 7.79 and 3.35 respectively and an Impact Value of 1.70. He also has good form here at Pontefract and over the past year, has had nine winners (21.95%) and 19 places (46.34%) from 41 runners, for level stakes profits of 7.01 and 8.33 respectively and an Impact Value of 1.95. 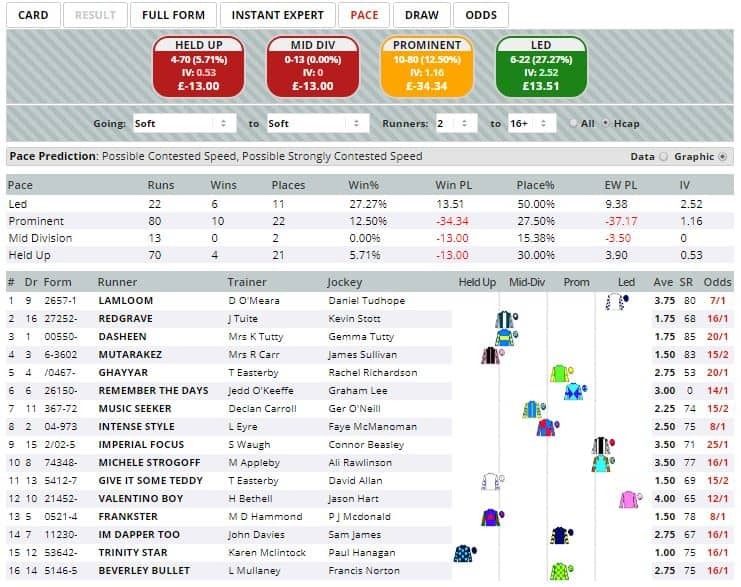 The Pace report shows that early leaders here over this distance have a super record, with 27.27% of them going on to win the race, for a level stakes profit of 13.51 and an Impact Value of 2.52. Laloom is usually quickly out of the stalls and looks likely to be one of the early leaders. If he can obtain a good early position then I am hopeful that he will have the class to grab at least a place. Click here for the 15:55 Pontefract. Is this section still on going? I found it quite usefull but havent seen any post since 2nd of May? Yes, Race of the Day will be published this evening ready for tomorrow. Thanks Steve. I thought maybe you were on vacation or something like that. It says on the page this is posted Monday to Friday but I know it is usually only 4 times a week or so. I rather have quality than quantity but since I didnt see anything for the last 5 days I was wondering if this may have been cancelled thats all.